quarrygirl.com » Blog Archive » Buca di Beppo – no, I don’t know what it means either! 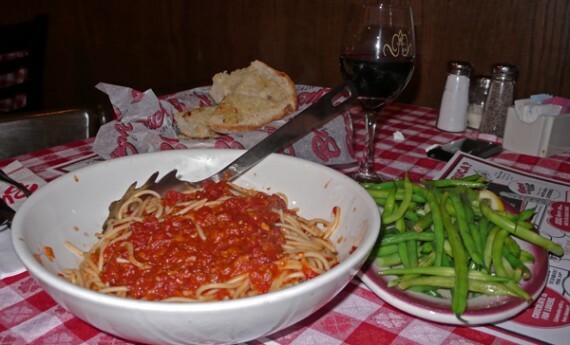 Buca di Beppo – no, I don’t know what it means either! 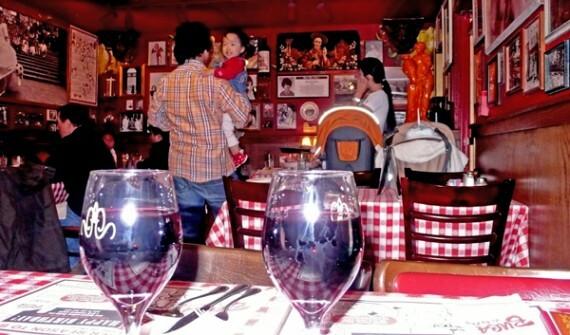 Everybody in America knows Buca Di Beppo… The down-market chain of pseudo Italian-American diners with ebullient servers and over-the-top Italianate décor has won its place in the hearts and minds of many cities – 90 locations, to be exact. 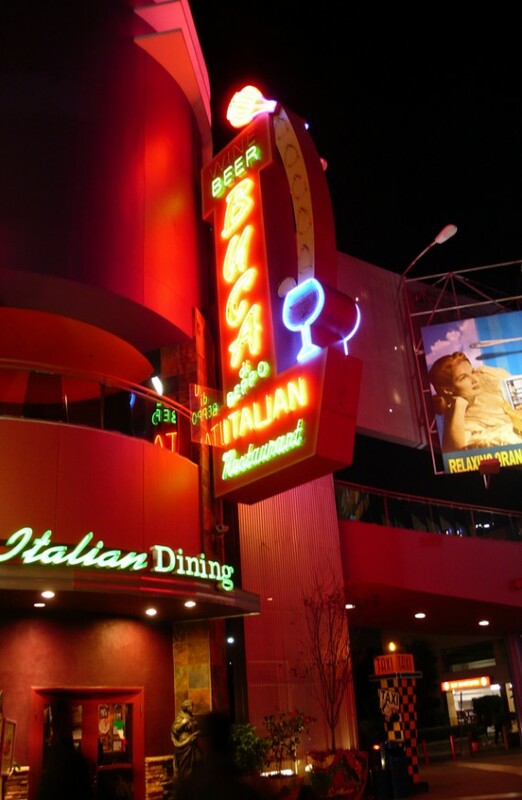 The very first Buca di Beppo I visited was in Seattle. My mother (a fluent Italian speaker who lived in Italy for many years) was quite enchanted by the place. She pointed out pictures of Frank Sinatra, The Pope, Sophia Loren (who bears an uncanny likeness to my mother in the 60s…. Not now, though, for sure) and was overjoyed to be greeted by an Italian-speaker who led us to our table via the kitchen, then handed us our menus. My mother, who LOVES to speak Italian (given the most minute opportunity) immediately engaged with our server in his supposed native tongue. He became a little flustered right away, and I realized after a few back-and-forths that they had began to speak in SPANISH (yeah, my mother is also fluent in that). It turned out that Giuseppe from Napoli was actually Marco, from El Salvador. A very pleasant medical undergrad from UW who had grown his moustache out to look “more Italian”. Yes, like Marco, every single thing about Buca di Beppo is completely, 100% and absolutely not what it appears to be. From plastic statues to Plexiglas windows to bulk wine served in a fancy bottle – the farcical nature of the place cannot be under (or over) estimated. The menu is rather diverse – everything from “garlic olive oil bread” to “seafood pasta”, so a splendid time should be guaranteed for all. I ended up at the Universal City Walk outlet a couple of weeks ago with some rather drunk omni friends. I’d researched all the restaurants in advance, and Buca di Beppo was the only one to have several websites glorifying their vegan options, with pasted emails from the management as proof (not to mention the blessing of a trusted iPhone application). So, it was with grand aplomb that we showed up there, rather inebriated, around 10pm on a Sunday night. I had my entire meal planned out – I was going to get a couple of orders of “Garlic Bread” (without cheese), which is allegedly entirely vegan – bread with no milk or egg additives, olive oil and fresh garlic. The dudes I was with got various horrific and non-vegan dishes, but I must admit the garlic bread was pretty good. Not as good as the old-style bread they used to do (which came in a round cake pan) but still very tasty. Continuing the olive oil theme, I was craving for green vegetables, so “Green Beans” sounded amazing. And, indeed they were. Crunchy on the outside, smooth as silk on the inside they alone would have been a very nice entrée. BUT, neither of those offerings are particularly “Italian”, so I also ordered the “Spaghetti Marinara” which was completely, 100% predictably boring but nevertheless filled a gap. The food for vegans is uninspiring, but a LOT better than we can usually expect at, say, a Chili’s or TGI Friday’s. If you can deal with the trashy interior of noisy families, staff that are outwardly friendly but glare at you with hatred if you have to get politely serious for a moment about something that’s not right – then you’re in for a treat. Just don’t be tempted to get the “wine by the glass deal” when you show up. They will pour slightly generous glasses of weak Vermentino (the soda-pop of Italian wine) for $8 a pop. Take six friends, three glasses of wine each and you’ve drank $144 worth of wine. Even with their expensive meat options, the bill was “only” $260 for six people — of which $120 was the food. Yeah, Buca is not the best place in the world to eat for a multitude of reasons, but they do have food options that the servers confirm as vegan and seem to cater for us specifically. For that reason alone, they are worth supporting. If you find yourself in a tourist destination somewhere in the continental US chances are there’s a Buca di Beppo nearby who can cater for you. As always, check the menu, ask the servers and (if you’re paranoid like me) call Corporate to check that things which claim to be vegan really are. Finally, there’s something cathartic about Buca: fake décor, fake ambience, fake food, fake people: perfectly suited for omnis. I used to live about 5 blocks away from the “original” Buca Di Beppo in Minneapolis. The food at all the chains is so inferior to what you get at the same restaurants in the twin cities it’s pathetic. Every night there was a 2 to 3 hour wait, and it was worth it. They used to have an amazing spaghetti aglio olio with tons of fresh vegetables like broccoli, carrots, mushrooms and tons of garlic. I tried the same dish in Orlando and it was pretty much all zucchini and oil. Disgusting. Now they have completely removed it off the menu. They also used to have a traditional cheeseless margherita pizza which was vegan, now the same thing has cheese on it and a different recipe. The only thing I look forward to there now is the limoncello. … why don’t you ask your mom what it means? Katie: The literal translation is “basement of Joe” or something similar. Even after knowing that, I’m still none the wiser about what it means! Kevin: The aglio olio was my favorite pasta dish at Buca. I’m glad you reminded me of it, and I agree it’s sad that it’s no longer on the menu. It’s good to know there are vegan options @ Buca. A year or so ago we were wandering the streets of San Francisco late at night and only found a Buca but the menu didn’t appear very veg-friendly and what could’ve been made vegan was pretty $$$. Definately a nice option for dining w/omni’s in a pinch though. I can’t stand Buca and have only ever gone there kicking and screaming. The last time, I only ordered a salad and grilled the server (who just happened to understand veganism because he was one of those “used to be vegans”) about everything that came on said salad. Thank you for putting together this Buca tutorial for next time I’m dragged there! Good to know there are options! My family loves this place and I always opt to go elsewhere thinking there were no vegan choices. Thanks for the info! “Buca means hole (bocca means mouth). Beppo is a nickname for Guiseppe, which is the Italian equivalent of Joseph — hence Joe. So put together it means “joe’s hole” — as in “hole in the wall”. Buca di Beppo is scary in so many ways. The first time I went there was for some kind of birthday party in San Francisco in the 90’s and the kitchen people freaked me out by clapping and cheering for EVERY SINGLE customer that walked in or out the door. It was like their football team was scoring a goal every 30 seconds or something. It now reminds me of the ebullient horror that happens at Coldstone Ice Cream. Shouldn’t they be busy cooking and making food or something? The first thought that came to mind was how miserable it must be to work there, even for out-of-work actors. I was just vegetarian then so there was plenty of food to eat in GIANT portions and some of it was pretty good like the tiramisu and the green beans. The pizza had rapini that got all stuck in my teeth. The menu was an annoying sign on the wall across the room, so you had to walk across the room to read the menu instead of sitting at the table, looking at a menu, and placing your order like a normal sit-down restaurant. Seriously, I think that restaurant chain should only be allowed in theme parks like Disneyland, Universal City Walk, etc. where everything is fake already so the experience isn’t so jarring. we saw a rat running through the kitchen when we were sitting at the “kitchen table” . 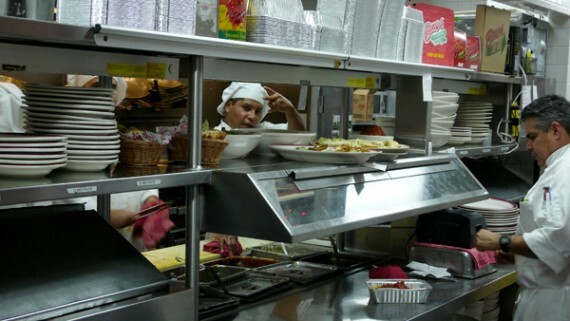 the people preparing food noticed that we noticed the rat so i think they went and told a manager ort something. anyway, we were so disgusted by this that we all got up and left. we hadnt even gotten our food yet just our drinks but we had eaten there once before and i thought it was all way too much salted , like they over-do it to hide the crap taste of their food? its a shame they call this italian food also because they give italian food a bad name. me and my family and now my friends whom ive told all about our rat experience will never go to this gross place again and they will be spreading the word to avoid this place like the plague! I believe SOME of you are just plain liars and are bent on sabotaging something that is a successful idea. If it isn’t for you then you have four options. 1) DON’T GO 2) write an intelligent letter to the corporate to ask for food items on behalf of the Practicing Vegan. Most corporations will listen to the masses, its just good business. Which would mean you Vegans have to get organized. 3) Create your own restaurant where everything is Authentic, wait very little of what we consume in this country (USA) is authentic or original from the country it is paying homage to. Chinese food we eat in the USA is not served or found in China. Being a Master Chef (which means I have studied to conduct my craft in every country in the world) I would know a thing or two about the origins and its REAL authenticity. Vegans I believe are a compromise from the Raw food movement from the mid sixties when it became hugely popular by the Bohemians. The reason for eating Raw, Vegetarian, and Vegan is to get more ethically connected to life in this planet and increase the respect of each life. Mostly the movement is a farce. Because reading your posts and listening to most Vegans I meet you are mean, condescending and down right rude. You self indulgent and bratty. People are starving, do you help? Im have been at the soup kitchens and NEVER met a vegan there. I have worked at animal shelters in Zimbabwe to California and NEVER met a Vegan nor a Vegetarian. So what gets me is the lack of realness in all of your post when you claim a theme restaurant which is trying to bring what life was like for a specific Italian AMERICAN is fake and people who are trying to make a decent honest living and fake and how it gives Italian cuisine a bad name. I think most of you give humans a bad name. Evolve and be a little kinder by doing something to HELP the world instead of hurting everyone with this dark candor! @Cookingbear: I know you probably won’t read this because you are not vegan and obviously didn’t like what you read, but for those of us offended, I have to speak up. I am a vegan and I volunteer at several food banks and soup kitchens. They even have food services that center around being vegan and vegetarian like Food Not Bombs. I also volunteer with various animal organizations and shelters. It’s a shame that you don’t see many vegans at those places, but in all honesty, you won’t see many vegans any place other than a vegan specific store, blog or restaurant. If you want people to respect others, try doing it yourself and quit the stereotyping. These people had bad experiences and were treated rudely by others who put down their lifestyle (like yourself) they are free to share their feelings on a vegan blog whenever they wish. Oh and I just went there the other night with my boyfriend after reading this blog entry. That place was horrible on every level. It was freezing, the constant “Italian-ness” steretyping and crazy decor was way over the top (I’m Italian, we are not all like that), they pretty much were playing the “Casino” soundtrack (soooo Italian) and the waitress gave me weird looks everytime I (politely) requested no parmesean cheese, and then slathered parmesean cheese all over every thing I ordered 🙁 Even my meat and cheese loving boyfriend was kinda pissed. We payed $60 for stuff we could have made at home for much cheaper and tastier. Oh and $2.75 for soda? !